Well the Wings played well enough to win but they didn't. Detroit dominated the second period while scoring two goals and lead 2-1 going to the third. The Wings knew Vancouver would come out strong in the final period and once again Detroit could not hold a lead. Canucks scored two in the third to win 3-2. Again, first PP unit has nothing to show for using 5 of a possible 6 total minutes of PP time. ——Well the Wings played well enough to win but they didn’t. Lughes for Hughes! I don’t mind losing close games where we play well. Hopefully by camp next fall we’ll have learned from all the mistakes of this year. Great way to lose a game. Compete and be close but still get 0 points. Keep it up, got to beat the Hawks to the bottom. I was thinking they were playing good and it ends in 0 points. Was thinking about Larkin, fuming with the last 2 goals. D is pretty bad with some old farts. Hopefully a top 4 D can be drafted soon. The Horvat goal was a back breaker. Between the legs of kronner and Bernie. That was fugly. 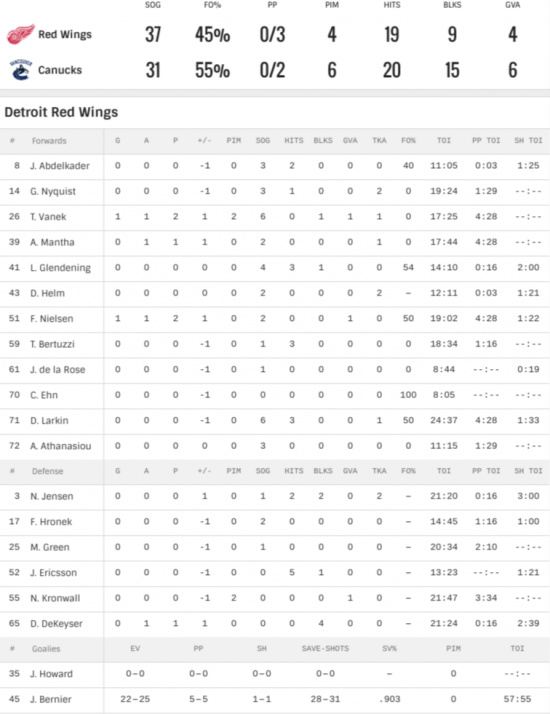 The Wings seem to lose their legs in the 3rd. Looked flat.